Six-Story Development to “NEST” Across from Lunch & Supper! Two developers are swooping into Scott’s Addition with a $20 million apartment project that will bring more height near the neighborhood’s Broad Street border. 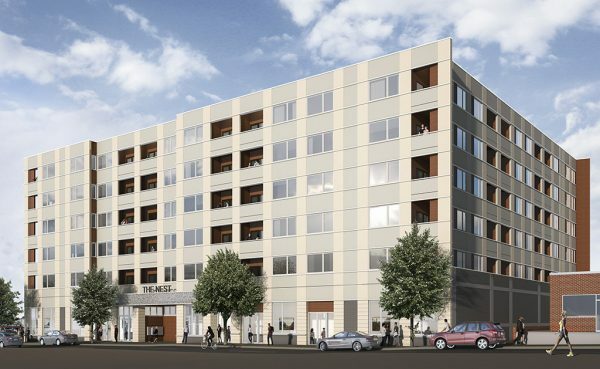 An entity led by Geoff Shudtz of Richmond-based Dodson Commercial, along with Fountainhead Properties’ Tom Papa, is developing The Nest – a six-story, 118-unit apartment project set to rise on about 0.6 acres at 3105, 3107, 3113 and 3115 W. Marshall St.
Their group is under contract to purchase the properties for an undisclosed amount. The parcels are owned by Summit Suites LLC, a group led by Yogi Singh that bought the properties in a package deal in 2016 for $2.5 million. The properties, which houses two 1970s-era office buildings and two accompanying surface parking lots, most recently was assessed by the city at a combined $4.4 million. The group is expected to secure financing for the development and close on the property by year-end, Papa said. The existing office buildings will be razed. Richmond-based KBS Inc. has been tapped as The Nest’s general contractor. Walter Parks Architects is designing the project, Papa said. Upon its completion, Dodson Property Management will oversee management and leasing of the complex. The development would include five stories of apartments above a mix of parking and commercial space fronting West Marshall Street. 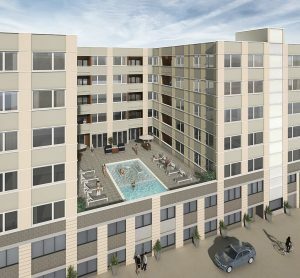 Amenities would include a shared work space component, a leasing office and a pool, Papa said. 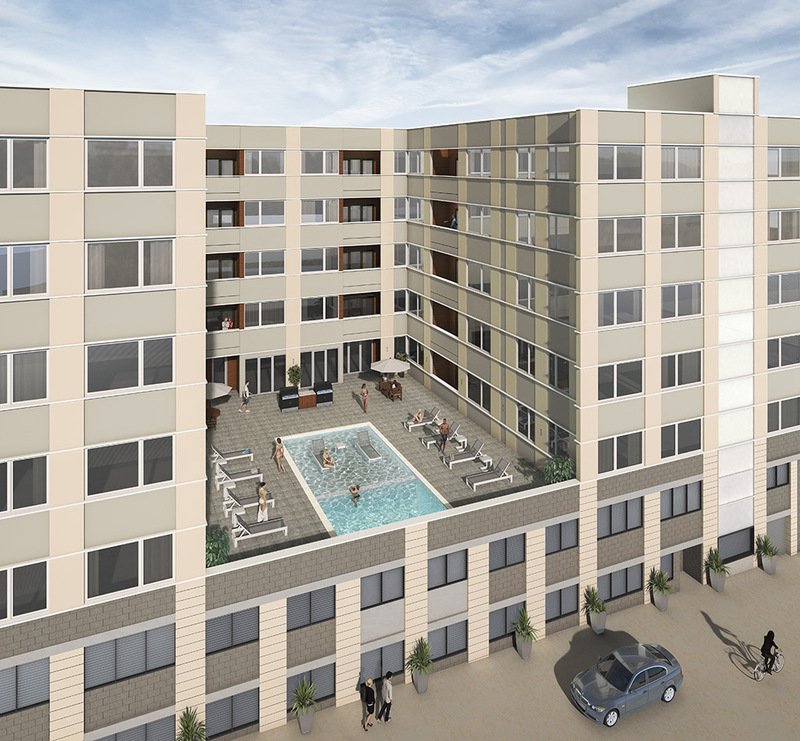 Amenities at The Nest will include a pool! The Nest is a change of course from what Singh’s group initially planned. Its Summit Suites concept was set to modernize the two office buildings, as well as the neighboring 3122 W. Marshall St. But after rehabbing the latter and filling it with new tenants, Singh said he began getting offers from other developers for the remaining parcels. “There were two things that happened,” Singh said. “First, the general momentum of Scott’s Addition brought a lot of attention to the two buildings. I also think the change of zoning (to TOD zoning) after our acquisition was a huge shot in the arm for those properties. “TOD zoning is the most flexible and advantageous for developers choosing to take the big bite like Tom and Geoff are taking,” he said. Singh said Schutz’s group has had the property under contract for about 11 months, which is longer than he’s usually willing to wait. “We only got comfortable with the drawn-out due-diligence process because Geoff chose to bring in a veteran developer like Tom,” he said. The Nest will add to a recent wave of taller buildings taking shape in Scott’s Addition. A block away from The Nest site, Eric Phipps and Bryan Smith of SNP Properties are planning to raze the former SunTrust Bank building at 3022 W. Broad St. to construct a six-story, 166-unit mixed-use development. As part of that project, the duo also purchased 3012 W. Broad St. last month for $815,000, according to city property records. The three-story building will be cleared to make way for the new development. Nathan Hughes with Sperity Real Estate Ventures represented the sellers in that deal. Meanwhile, cranes are swinging on Scott’s View, two residential towers with commercial street frontage planned by veteran Richmond developers Louis Salomonsky and David White on 2.5 acres at 1400 Roseneath Road.